Kenneth graduated from the University of Toronto with an Honors of Bachelor of Science. Most recently, he received his Masters of Physical Therapy at the University of British Columbia. Kenneth is a Fellow of the Canadian Academy of Manipulative Physiotherapy – an internationally recognized qualification in hands-on manual and manipulative therapy. Additionally, Ken is certified to perform Acupuncture, Gunn IMS (intramuscular stimulation) and has achieved extra credentials in the McKenzie Method of mechanical diagnosis and therapy (an internationally acclaimed method of assessment and treatment of spinal pain). Kenneth has interests in treating sports injuries, MVA related injuries, work-related injuries and especially those suffering from neck, back, and shoulder pain. Kenneth has volunteered for the 2012 BC Summer Games in Surrey, Earl Marriott Football, and is always getting involved with other sports teams and recreational activities in the South Surrey and White Rock communities. Kenneth is able to serve a variety of clientele in English and Cantonese. 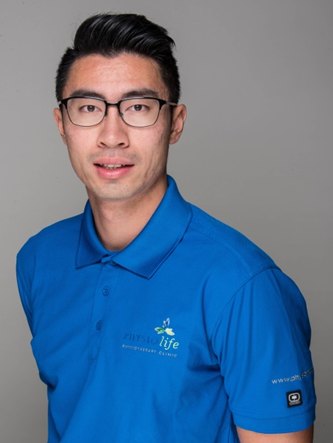 When not in the clinic, Kenneth is focused on pursuing additional orthopaedic levels, sports physiotherapy, and soft tissue release courses. Kenneth also enjoys spending time working out in the gym, and playing tennis, hockey, and basketball. Ken is also the captain of the PhysioLife basketball team.